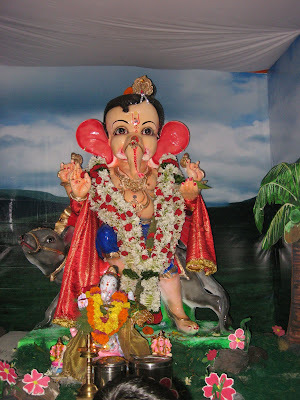 The idol is a replica of Ganesha as he appears in the animated movie for kids - Bal Ganesh. Not surprisingly, I wasn't able to identify the character, while Samhith did. We had to ask the organisers for confirmation, which resulted in a lot of amusement for all of them, but was worthwhile, since Samhith is thrilled that he was correct! Kids somehow have that extra eye of details! This Ganesha looks very nice! I can almost imagine Samhith's face all joy that he knew whereas mom didn't! I agree with Mridula. Can so imagine Samhith glee and expression at knowing more than you :D but Anu, I'm suprised you didn't place it. Those animated Ganesha toys and stuff are all over the place. How come Samhith doesn't have one?